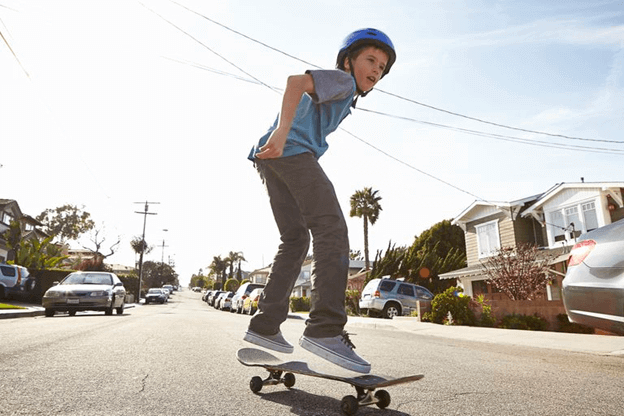 Many kids are attractive towards Skateboarding right from their early childhood! It is an action sport with full of thrill and excitement. It is tricky and the same time risky for skaters while riding a skateboard. It needs energy, the flexibility of body and dares to do stunts on a narrow board running on wheels. Thus skateboarding tips for beginners is something which every newbie skater should know since a single wrong turn or misjudgment can lead to the danger of physical and organ damage. It’s not easy for beginners or those who are practicing without any guidance to control the board as you want and like it to be. Instead, the skateboard can take your control and further you may fall by losing balance. To be a professional skater, it needs practice, practice, and practice! But while practicing it is necessary to take care of certain things to save yourself for the next ride on Skates! The very first thing for you as a skating beginner is to select the right skates having a thick deck and should be heavy. It can help you to maintain proper balance on the board, and you can prevent yourself from slipping off. After some practice, you can switch on to a thin deck having the concave area in its middle part. After getting the right skateboard next, you need to have is a collection of excellent quality skating gears like a helmet, skating shoes, elbow-Knee pads and wrist brace. Before starting it is advisable for every beginner to check the wear and tear and proper fitting of wheels and trucks of the skates. If required loose the kingpins to make sure the truck is not much tight, otherwise it can resist you to take turns with ease. Do not start riding before thoroughly practicing how to balance yourself on the wheels and skates. You need to know the proper place to keep your feet by placing it in different positions and trying on to make balance on the skateboard. Once you can balance yourself well keep the skateboard on any non-slippery surface like carpet or grass and try to completely stand and jump on it. Now you need to know and decide which stance is best for you while riding a skateboard. There are 3 stances in general, goofy (Skate by forwarding the right foot), regular (Skate by forwarding the left foot) and mongo (Skate by pushing with the back foot). Among all, beginners should not try to practice mongo since for many of them it is pretty time taking to learn. Next, you have to practice pushing the skateboard while balancing your body. Try to take a turn by keeping your body weight on the heels. After practice, you can make sharp turns. It is best to let the skateboard stops naturally after a push. However, you also need to learn foot braking whenever required. You need to use your back foot and grind it onto the ground to get a gentle foot braking. With time and more practice, you can also learn about stopping a skateboard via bail, heel drag, powerslide and boneless techniques. At last, we recommend the beginners to not try any tricks like kickflip, Ollie, magic flip, etc. before clearing and adequately practicing the basics of skateboarding. It’s all about practice! After all, practice makes a man perfect! Do comment and let us know which skateboarding tips for beginners you found exciting.